Light is a powerful yet often unappreciated feature of our urban experience. Future London speaks to the participants of the new Urban Lightscapes/Social Nightscapes project in London, an initiative exploring the role of light in our cities and highlighting its importance in how we design and interact with our urban spaces. Light and lighting are ever-present elements of city life, from flickering bus lights to dim overhead streetlights, to the large lighting features which illuminating our cities’ skylines. But while many other aspects of urban life enjoy dedicated research fields, something of a silo exists between lighting designers and social research. Enter Configuring Light, a joint initiative set up by co-founders Dr. Don Slater and Mona Sloane (LSE) and Dr. Joanne Entwistle (King’s College London). The initiative takes its impetus from the notion that “light has been largely invisible in the social sciences”, identifying a key gap between the research agendas around light in visual culture and the technical literature on light in the fields of architecture, design and energy studies. 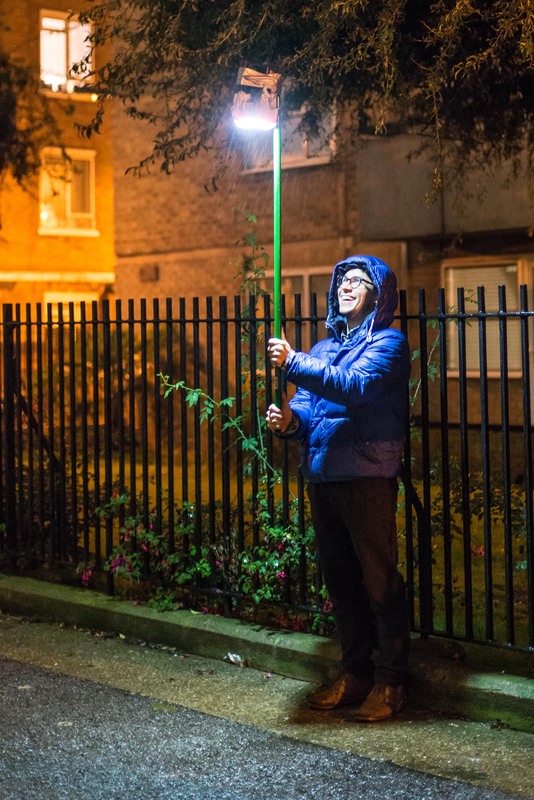 Last year the team ran Urban Lightscapes/Social Nightscapes– a site-specific project with residents, lighting designers and social scientists at London’s Whitecross Estate. The lighting design workshop, run in collaboration with Peabody’s IMPROVE project and the Social Light Movement, aimed to create new lighting design interventions to help improve the outdoor spaces on the estate. Bringing together lighting designers, architects, planners, residents and social scientists, the project sought to link lighting designers with the local community in order to understand life on the estate, lighting needs and to ultimately produce public lighting ideas that would best serve the area. Future London: The Configuring Light project states that ‘light has been largely invisible in the social sciences’ – why do you think this is so and how is this exclusion detrimental to the way we understand, research and design space? Mona Sloane: I think the issue with light and lighting is that it is a very particular infrastructure: it fundamentally determines the ways in which we socialize, quite broadly actually, anything we do, we do either in light or darkness. And yet do we ever hardly recognize light, it only becomes apparent when it either fails or becomes and object in its own right, for example through spectacle (think Christmas lights). This infrastructural quality of light leads to the problem that it is never discussed as such, its topicality is occupied and steered by a group of design or built environment experts (lighting designers, engineers, much less so architects) and because social science, or even the general public, has no ‘language of light’, it cannot connect to these debates. Lighting as a topic is currently gaining a new momentum with LED fuelling new discussions around energy efficiency, but also aesthetics and health and wellbeing in the city. We hope that the precedent we have generated with the Urban Lightscapes project opens up new possibilities to connect public lighting to the social fabric of a place, to bring together social research and lighting design in a very practical way. FL: What was the initial impetus behind the Urban Lightscapes/Social Nightscapes project? MS: The background story is very straightforward: in lighting design, social research is usually external to the design process itself. It would come in as pre-packaged information, through briefings, statistics, reports, regulations, consultant services etc., and it would be used to either verify common-sensical understandings of a space or to test a design concept against standardized pieces of information (or: facts) in order to measure it. What we call the ‘Social Research in Design’ approach turns this process around implies that doing social research should be an integral part of designing for the urban space. It means that designers remain critical of ‘pre-packaged‘ social research and keep posing questions, suggesting possible or previously unseen directions – and that they engage with the people they design for by way of going out and doing their own piece of social research. This is specifically crucial for lighting design as lighting is so fundamental to our experience of space and at the same time it is so difficult for us to comprehend how a space can actually be changed through lighting design and new lighting technologies that become available. Lighting designs based on Social Research in Design are explicitly site-specific and thus can be more effective and sustainable. FL: How do you understand the potentialities of a project like the Urban Lightscapes/Social Nightscapes, both for future formal design strategies or for community groups or projects? From our point of view, interdisciplinary collaborations like this are only at their beginning. The idea of putting the community at the heart of regeneration initiatives is not new, but what is new is that social researchers here play a crucial role and bring both a new perspective and a toolbox to the table that can, at least that is our point of view, help build spaces that are explicitly site-specific and respond to existing social uses. This is different from public consultations and means that everybody is a bit more invested (designers, developers, the community) and time plays a crucial role here: we spent five days on the estate, day and night, and our community engagement efforts began way before the workshop started, e.g. with an initial light walk for the Whitecross community. This is an aspect that surely needs to be taken into account when thinking about future formal design strategies, good design may take a while – just like good social research. But we hope that our approach of Social Research in Design can structure this process and help frame it in an efficient way. FL: How has light and lighting traditionally been approached by housing providers like Peabody and have you seen development any in this approach in recent years? Peabody: Much of our estate lighting has been installed as reactive works often relating to anti-social behaviour. Recently however our landscaping projects have incorporated some lighting elements within new green spaces and these have been well received by our residents. When approached by LSE and configuring light we were excited to see how we could explore this element further. FL: How do you understand the value of projects like Urban Lightscapes/Social Nightscapes? Peabody: It was very exciting for Peabody to be a part of such a unique project and working with LSE and Configuring Light has been a genuinely fun and collaborative experience that we hope to be able to take forward. This dialogue with social researchers and lighting designers is new to us and seeing the depth and quality of work that was involved in creating the designs at Whitecross has been extremely valuable. We have benefited from their knowledge and passion for light which has resulted in the consideration of lighting to be at the forefront of our minds when looking at how our estates and neighbourhoods are experienced. FL: How do you understand the potentialities of a project like this, both for future formal design strategies or for community groups or projects? Peabody: The workshop at Whitecross showed us the power that lighting, particularly through the guerrilla lighting event, has to engage with our residents on a meaningful level. Our residents were actively involved and were able to physically see the transformation of their neighbourhood through a fun and entertaining activity. This project has shown us the potential of design work, that is informed by social research, to help create design and lighting solutions that will be valued by the people who both live in our estates and also those who experience them as part of their day to day lives as they navigate through London. FL: How do you understand the role of light/lighting in shaping space, and in particular, public space? GF: Lighting plays a very important part in in the design of public space and urban design in general. Light defines space, how people feel within it and how people perceive the buildings, structures and materials that make it. The way we use light contributes to the perception of comfort and safety, in particular choices of colour (colour temperature) and light on vertical surfaces. The use of contrast – shadow and darkness are just as important as light when designing for public space. The way we light a space also defines who it is for, if we light it for cars then it won’t feel as comfortable for people as it could. When lighting public space lighting designers often have to challenge the conventional methods, mostly dictated by standards, to create an environment for people to use, to improve the well-being of those occupying it, encouraging more night-time use and thereby increasing the perception of safety (reduced crime, fear of crime and the associated financial and social costs). All of this works towards delivering more sustainable communities. FL: How do you think the Urban Lightscapes/Social Nightscapes project challenges conventional lighting design practice? GF: Lighting designers are already challenging many of the conventional practices that have been employed in the lighting of public realm for many years. However there are still many designers and engineers who do not understand the potential for lighting to contribute as I have described above. The Urban Lightscapes/Social Nightscapes project and in particular the Whitecross Workshop, enables lighting designers who maybe haven’t had the opportunity to work on public realm projects in the past, to understand many of these issues more fully. The project also raises these important principles in an arena that allows for them to be discussed more widely outside of the lighting design profession and for lighting designers to realise there is scope for collaboration with other disciplines in the understanding and development of these ideas further. Ultimately this can enable us to develop strategies to facilitate implementation of higher quality lighting on a practical level. Another extremely important lesson we can take away from this project, is how much public engagement can contribute to the design process in the UK much more than it does at the moment. As designers we understand how public consultation is important, but we do not necessarily have the skills or experience to get the most from engagement with those who will be using the spaces for which we design. 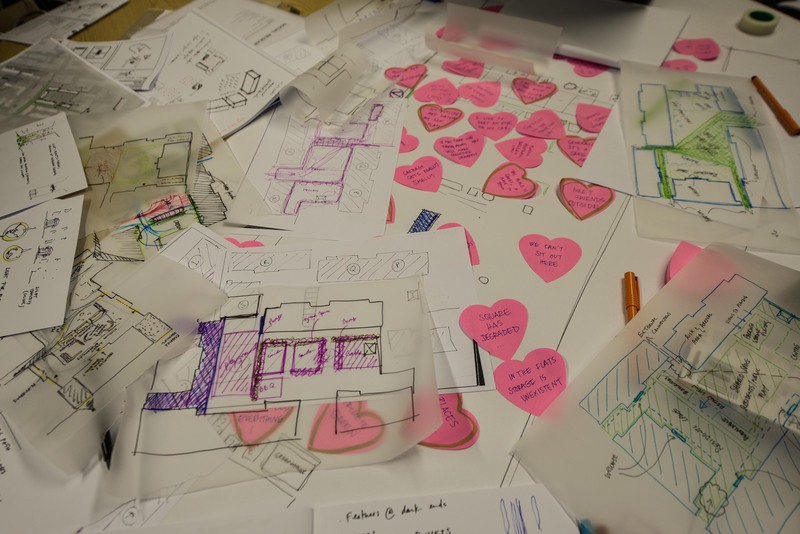 Without experience and guidance for many of us it is difficult to engage fully and come away from the process with information that will really make a difference to the approach we may take to the final design. The practical workshops gave us an opportunity to practice these skills, to learn from others and so feel more confident to propose to our clients that this is the way we should proceed in the future. GF: The evidence that the Whitecross workshops brings has potential to support changes in the way projects are managed to allow us to implement improvements in the design of spaces. This evidence gives us opportunities to influence our clients and encourage them to allow us to integrate community involvement in the design process more fully than we have been able to in the past. The project has demonstrated how community engagement plays a very important role and also how it contributes to a more integrated approach to design. Lighting should not be undertaken as a separate exercise when working with public space it must be part of the wider design process of landscape, architectural and urban design. The workshop also demonstrated how working with residents can be a positive influence not only on the design, by understanding the needs of a community better, but also to gain support from those using the space; when people feel that something is being designed for them and not imposed upon them they feel more inclined to contribute to the discussion, enabling a designer to gain an even better understanding of their needs. The final outcome should, as a result be welcomed more readily, embraced and used by residents which will also build stronger relationships between residents and the housing association which can only be a positive thing.